The Ural Mountains (Russian: Ура́льские го́ры, Uralskiye gory) are a mountain range that runs approximately from north to south through western Russia, from the coast of the Arctic Ocean to the Ural River and northwestern Kazakhstan. Their eastern side is usually considered the natural boundary between Europe and Asia. The mountains lie within the Ural geographical region and significantly overlap with the Ural Federal District and Ural economic region. They are rich in various deposits, including metal ores, coal, precious and semi-precious stones, and since the 18th century have been the major mineral base of Russia. In Greco-Roman antiquity, Pliny the Elder thought that the Urals correspond to the Riphean Mountains mentioned by various authors, including Arabic sources of the 10th century. As attested by Sigismund von Herberstein, in the 16th century Russians called the range by a variety of names derived from the Russian words for rock (stone) and belt. The modern Russian name for the Urals (Урал, Ural), which first appeared in the 16th-17th century, was initially applied to its southern parts and gained currency as the name of the entire range during the 18th century. It might be a borrowing from either Turkic (Bashkir, where the same name is used for the range), or Ob-Ugric. From the 13th century, in Bashkortostan there has been a legend about a hero named Ural. He sacrificed his life for the sake of his people and they poured a stone pile over his grave which later turned into the Ural Mountains. As Middle-eastern merchants traded with the Bashkirs and other people living on the western slopes of the Urals as far north as Great Perm, since at least the 10th century medieval mideastern geographers had been aware of the existence of the mountain range in its entirety, stretching as far as to the Arctic Ocean in the north. The first Russian mention of the mountains to the east of the East European Plain is provided by the Primary Chronicle, when it describes the Novgorodian expedition to the upper reaches of the Pechora in 1096. During the next few centuries Novgorodians engaged in fur trading with the local population and collected tribute from Yugra and Great Perm, slowly expanding southwards. The rivers Chusovaya and Belaya were first mentioned in the chronicles of 1396 and 1468, respectively. In 1430 the town of Solikamsk (Kama Salt) was founded on the Kama at the foothills of the Urals, where salt was produced in open pans. Ivan III of Moscow captured Perm, Pechora and Yugra from the declining Novgorod Republic in 1472. With the excursions of 1483 and 1499-1500 across the Urals Moscow managed to subjugate Yugra completely. 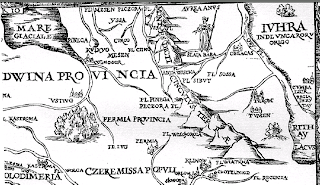 Nevertheless, around that time early 16th century Polish geographer Maciej of Miechów in his influential Tractatus de duabus Sarmatiis (1517) argued that there were no mountains in Eastern Europe at all, challenging the point of view of some authors of Classical antiquity, popular during the Renaissance. 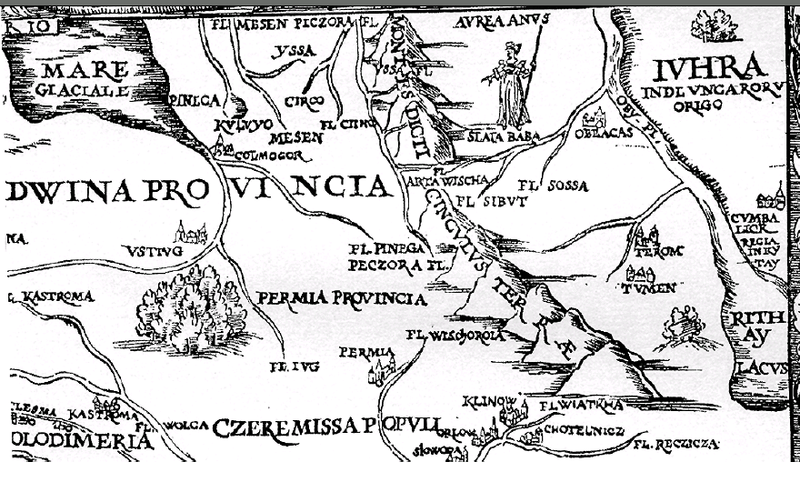 Only after Sigismund von Herberstein in his Notes on Muscovite Affairs (1549) had reported, following Russian sources, that there are mountains behind the Pechora and identified them with the Ripheans and Hyperboreans of ancient authors, did the existence of the Urals, or at least of its northern part, become firmly established in the Western geography. The Middle and Southern Urals were still largely unavailable and unknown to the Russian or Western European geographers. In the 1550s, after the Tsardom of Russia had defeated the Khanate of Kazan and proceeded to gradually annex the lands of the Bashkirs, the Russians finally reached the southern part of the mountain chain. In 1574 they founded Ufa. The upper reaches of the Kama and Chusovaya in the Middle Urals, still unexplored, as well as parts of Transuralia still held by the hostile Siberian Khanate, were granted to the Stroganovs by several decrees of the tsar in 1558-1574. The Stroganovs' land provided the staging ground for Yermak's incursion into Siberia. Yermak crossed the Urals from the Chusovaya to the Tagil around 1581. In 1597 Babinov's road was built across the Urals from Solikamsk to the valley of the Tura, where the town of Verkhoturye (Upper Tura) was founded in 1598. Customs was established in Verkhoturye shortly thereafter and the road was made the only legal connection between European Russia and Siberia for a long time. In 1648 the town of Kungur was founded at the western foothills of the Middle Urals. During the 17th century the first deposits of iron and copper ores, mica, gemstones and other minerals were discovered in the Urals. Iron and copper smelting works emerged. They multiplied particularly quickly during the reign of Peter I of Russia. In 1720-1722 he commissioned Vasily Tatishchev to oversee and develop the mining and smelting works in the Urals. Tatishchev proposed a new copper smelting factory in Yegoshikha, which would eventually become the core of the city of Perm and a new iron smelting factory on the Iset, which would become the largest in the world at the time of construction and give birth to the city of Yekaterinburg. Both factories were actually founded by Tatishchev's successor, Georg Wilhelm de Gennin, in 1723. Tatishchev returned to the Urals on the order of Empress Anna to succeed de Gennin in 1734-1737. Transportation of the output of the smelting works to the markets of European Russia necessitated the construction of the Siberian Route from Yekaterinburg across the Urals to Kungur and Yegoshikha (Perm) and further to Moscow, which was completed in 1763 and rendered Babinov's road obsolete. In 1745 gold was discovered in the Urals at Beryozovskoye and later at other deposits. It has been mined since 1747. The first railway across the Urals had been built by 1878 and linked Perm to Yekaterinburg via Chusovoy, Kushva and Nizhny Tagil. In 1890 a railway linked Ufa and Chelyabinsk via Zlatoust. In 1896 this section became a part of the Trans-Siberian Railway. In 1909 yet another railway connecting Perm and Yekaterinburg passed through Kungur by the way of the Siberian Route. It has eventually replaced the Ufa – Chelyabinsk section as the main trunk of the Trans-Siberian railway. The highest peak of the Urals, Mount Narodnaya, was discovered in 1927. During the Soviet industrialization in the 1930s the city of Magnitogorsk was founded in the southeastern Urals as a center of iron smelting and steelmaking. During the German invasion of the Soviet Union in 1941-1942, faced with the threat of having a significant part of the Soviet territories occupied by the enemy, the gorvernment evacuated many of the industrial enterprises of European Russia and Ukraine to the eastern foothills of the Urals, considered a safe place out of reach of the German bombers and troops. Three giant tank factories were established at the Uralmash in Sverdlovsk (as Yekaterinburg used to be known), Uralvagonzavod in Nizhny Tagil, and Chelyabinsk Tractor Plant in Chelyabinsk. After the war, in 1947-1948, Chum – Labytnangi railway, built with the forced labor of Gulag inmates, crossed the Polar Urals. One of the first scientific descriptions of the mountains was published in 1770–71. Over the next century, the region was studied by scientists from a number of countries, including Russia (geologist Alexander Karpinsky, botanist P.N. Krylov and zoologist L.P. Sabaneev), England (geologist Sir Roderick Murchison), France (paleontologist Edouard de Verneuil), and Germany (naturalist Alexander von Humboldt, geologist Alexander Keyserling). In 1845, Murchison, who had according to Encyclopædia Britannica "compiled the first geologic map of the Urals in 1841", published The Geology of Russia in Europe and the Ural Mountains with de Verneuil and Keyserling.